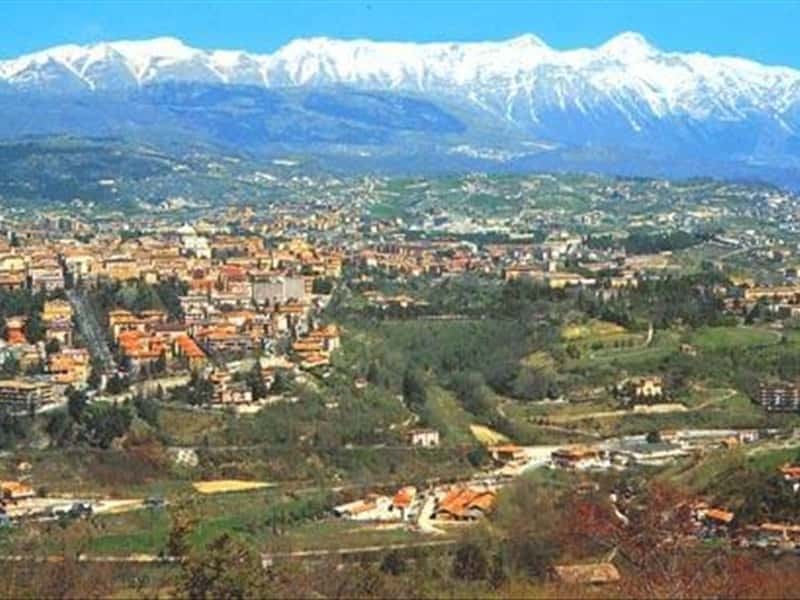 L'Aquila sits upon a hillside in the middle of a valley of the river Aterno, surrounded by the massif mountains of the Gran Sasso and Velino Silente. The city was founded by the Emperor Federico II of Svevia in 1245; the city is the result of an intense building of houses, churches and main squares between the castles and the fortified towers. The city's name derives from the water springs generated in the area, that feed the Fountain of 99 Cannelle alla Riviera. In 1254 the city was officially recognized by Corrado IV and after the city destruction by the Manfredi in 1259 Charles I d'Anjou gave a new building impulse to the inhabitants. The Basilica of Santa Maria di Collemaggio is the most important church in Romanesque style of the whole city. It was built in 1287 on request of the hermit Pietro del Morrone, who was proclaimed Pope here August 29th 1294. The features propose the strong influence of the Roman-Gothic Abruzzese styles for the plain walls, such as the one block façade which is the real monumental element of the whole building. Even though the façade is in Neoclassic style, the Cathedral of San Massimo is of the '200; it features two high bell towers located on each side of the main entrance portal, which holds a pediment supported by four columns. Inside a Early Christian sarcophagus is on exhibition. The 99 Pipe Fountain , completed in 1272 based on the project of the architect Tancredi da Pentima, are two large pools surrounded by 99 different mask plates, each one with a water pipe. The tradition reports that these masks represent the Lords of the 99 castles that Federico II united when he founded the city. The Basilica of San Bernardino was built by the disciples of the Saint of Siena in 1454 in a Renaissance style with a facade divided in three orders with different decoration styles: Doric for the first, Ionic for the second and Corinth for the third. It is a three naved church and the central one presents a wooden carved box ceiling, painted in gold. Not to miss from a archeological point of view are the traces of the Sabin settlement of Amiternum and the catacombs of San Vittorino. This town web page has been visited 32,199 times.